Says Ash Gray, head of brand and marketing, Bank of Melbourne, said the story echoes the aspirations of the bank’s customers. 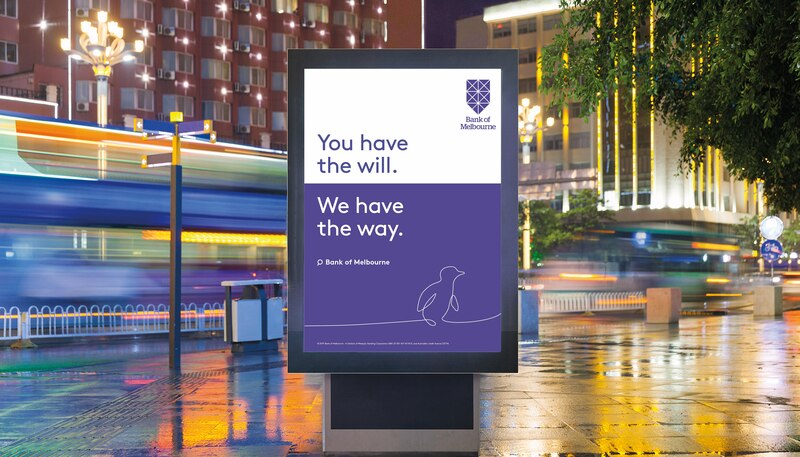 Says Gray: “Bank of Melbourne’s refreshed brand highlights our ongoing commitment to helping customers find a way forward with our tailored products and exceptional service. Good one Saatchi’s, I almost fell for it. I like it, different tack for a bank. Surely this is just another expensive joke? No one is releasing another penguin based ad for another service industry client are they? Want to get lunch at 12:30 Kerem and Tim? Pho? Spirko made an animated dragon for St George, an animated magpie for Bank SA, and now he’s followed it up with an animated penguin. Genius. They always say the sequel never lives up to the original. Not sure why you’d try and make the poor bank version of a John Lewis classic. Despite it featuring a Penguin, it’s still a really nice execution and your everyday punter is going to love it. I’m hoping this is a April 1 joke coz this is a stinker. It’s a lot like the John Lewis ad without the emotion or storytelling. You had me a Gangstarr. Looks beautiful. what an awful thing to post. Really nice spot. Lots of people at my agency were talking about this today / noticed it last night. Stick out like a sore thumb. The Bupa ad does penguins better. This just feels contrived beginning to end. Lucky the music track bails them out otherwise this one’s a dud. How does the execution relate at all to ‘way’ that is promised? I get the metaphor of the penguin being a swimming coach… Kinda. But what are those messy cuts with the cardboard boxes and the sold sticker? I’ve watched three times now. They’re crammed in there. It’s jarring. Feels unfinished and rushed. Pity. I do see the point of the previous commenter. The rags to riches story is difficult to pick up, even in the long edit. The ‘reveal’ that it’s the swimming cap that helps this cute little creature realise its dreams will be lost on many as those shots are fleeting. I missed it on first viewing myself. Maybe I’m in the minority but I do wonder if this output is how it came together in the storyboards. Is the joke on us? The penguin is cute and the song is catchy. But will I rewatch this? No. Will I remember who the ad is for? No. Is it ownable in any way? No. Will it make me switch banks? No. Does it even figuratively demonstrate how bank can help me achieve my goals? No. Could this equally have been a spot for either A) An energy drink B) A price comparison site C) A mobile phone service provider D) A power company? Wow, thank you. I’ve watched it twice and seen it on tv. I hadn’t picked up any of the swimming cap story, did you work on this job or actually read that into it just from watching? I’m just curious to know if people actually understand that coz I missed that by miles. You can win on this actually. Even in this category… See recent Westpac work by DDB as a case and point. Plenty of time, money and effort will have gone into this campaign. No it’s not a stinker and yes it’s more charming than most spots but compare it to the recent brand campaigns in the category (the only playing field that matters) and you’ll find this one’s near the bottom of the heap. Point taken on the unfortunate overuse of penguins of late, but this is hardly a stinker in comparison to most other Aussie ads. Well done to the team for convincing the client to tell a nice, simple story, with a great music track. What are you keyboard jockies on about? It’s a simple story about a cute penguin who makes it in the big city. It’s really nice. Especially In comparison to the other bank ads. How is this better than Westpac, Commbank or NAB ads? At least I can understand those and remember who they’re for. When your music is your saving grace you know you’ve fluffed your lines. Fact. What have people got against Saatchi? I didn’t have an issue with comprehension at all. Nice work guys! Loved the brave music choice. Maybe there was a subtle storie lines but this is a pretty cool ad in my books. It’s really sweet. CB is a sad toxic place where people tear down rather than build up. Would have loved to have seen the look on Saatchi’s faces when the BUPA ad went live. This is like NRMA and Westpac “Help is who we are/what Australians do” all over again. Looking through the picture I could feel, this penguin was feeling tired when the weather in the south was getting hotter. Jealous of the song. Whish I’d got that in a bank ad. It’s not cool to be hating on Saatchis. They’re like the short, fat kid you used to feel sorry for in your school basketball team. Tenacious, but ultimately useless. A good story I thought. Like the music. Why do people think a penguin is an idea? If you have 2 ads, both with cowboys…does that mean they are the same? Looked great on tv, Music is good too. While story construct is a tad familiar and perhaps a bit too much story crammed in, the character is cute, track is a classic. Feels unexpected in bank ads, which normally make me want to staple my eyelids shut. Well done. I don’t think anyone’s hating on Saatchi, just the ad. Everyone seems to have the same comments. It’s got an overused character, you wouldn’t use a meerkat would you? The story is hard to follow, is the penguin a swimming coach, entrepreneur or a home buyer? Agree, the execution here is what is lacking. Would work as a 90s but this 60s is clearly not something that is easily interpreted by everyone, something most ads should aspire to. Caught the 30s at couple nights ago and that’s even worse. If it was just stripped back to the swimming coach angle it would be enough. This is a classic case of over-egging. The penguin is a swimming coach, an entrepreneur and a home buyer… feel like you got the story just fine. Idiot. Am I wrong in thinking this is the penguin getting glimpses of his future? That’s why I quite liked the fast pace. The brief may have had too many bank boxes to tick but other than that it worked. It’s actually quite good. For those who hate, stew in your own ineptitude. It’s good. Nice, fun, simple. Is there another local ad with a penguin in it? So what? There are probably other local ads with people in them too. In the other ad, does the penguin become such a success through making swim caps that s/he can buy her/his own home? No? As the more astute comments have said, normal people will think this is charming and like the bank because of it. People are haters aren’t they, how does this get 47 comments, wayyy too much time on people’s hands. I caught this on TV last night, a shorter version from memory but I like it and I got it, one of the subtle story beats took me the second viewing to get but that didn’t effect my takeout at all, I think that’s what people call layering, making something interesting to watch more than once. I could see the progression of the penguin, in her life and I assume how the bank helped, home loans etc. The spot stands out for me, I wanted to watch it, I liked the penguin and what she represents. Very good if you ask me, nice craft and really stood out on telly. Killer track. I can’t take the cutesy crap serious knowing that it’s an ad for a crooked bank. Unfortunately people will probably remember the bankwest logo a long time after they’ve forgotten this flimsy soulless attempt at a story. I love this and having worked on several banks now think it’s refreshing and different for the financial category – why not have a bit of fun? It’s beautifully executed and tells a lovely ‘rags to riches’ story – the team who worked on it should very proud! Most disappointing (but not surprising) is that once again we continue to use this forum of intelligent and creative minds to generate and swap negative, cruel, petty remarks. We should be celebrating great work and inspiring each other to do better, rather than continually tearing each other apart. Snap out of it adland! We’re our own worst enemy! Please don’t call this hate. I was drawn to this post by the number of comments. I didn’t understand the spot at all. I don’t dislike it but I’m sorry I didn’t get it. Perhaps a little too subtle for this old timer. Just an opinion. I feel Saatchis needed to hit this one out of the park. It’s been so long since I’d heard from them and to be honest I wasn’t even sure there was a Melbourne office any more! A glance at their website suggests they were the most effective Agency of the year – in 2015!!! The work featured on their site is nearly 5 years old! This brand campaign came to them at an opportune time to work on a bank brand outside the big 4. It was their big chance to emerge from the shadows and show the industry what they’re capable of. I’m sure they would have thrown the kitchen sink at this and unfortunately, either by design or perhaps through stakeholder feedback, they’ve fallen a little short of the mark with this work – in my opinion. Not to worry though, 2025 isn’t too far away. I like the render. Came out nicely. There’s a lot going on in this spot so you really need to concentrate to follow the narrative. That’s a big ask these days. As usual, the blog is overrun by bed wetters and edm jockeys. Lets clear a few things up. Financial institutions, like Bank of Melbourne, do not make comms platforms of this scale without rigorous testing. I’d suggest this particular piece of work was tested at concept stage, most likely pre-production with animatics and definitely post. If your having trouble understanding the narrative, know that thousands of consumers, yes regular folk eating sandwiches, did not. Now, back to your cubicles, there’s an mrec that needs resizing. That last comment reeked of defensiveness… Here’s hoping your Client isn’t reading this mate! Not just because of ‘your’ spelling, but also because it reads like the post of a worried senior creative…. This f**king track tho…10 points for just getting that over the line! Bang on. GoT complexity in a TV spot. What ever happened to ‘simple works best’? Really like this ad team. Well done. What’s up with the debate on this website? Slow news day in Australia? Yep campaigns for the pride of one. Unprompted, the average person won’t tell these apart even if the discerning eyes on this forum can. You must be one of the snake oil salespersons that was apart of the “rigorous testing” lol… maybe you’re the one who came up with the idea of using a cute penguin (who doesn’t like penguins) to try and hide the fact the whole banking industry is under fire, royal commissions, low consumer confidence, deception etc… Gross. Does seem ‘common sense’ is in the know. Damage control? I smell a revision around the corner for you. Debrief will read as follows: “make it bloody work”.